Guwahati: In Assam, over 20,000 ‘D’ voters or ‘Doubtful voters’ from Gorkha community may strike a ‘dent’ in the ruling BJP’s vote bank over the state’s three-phased Lok Sabha polls. Widespread discontent among the community of around 25 lakhs and living across at least seven Parliamentary seats in the state has turned out to be a worry for the saffron camp. 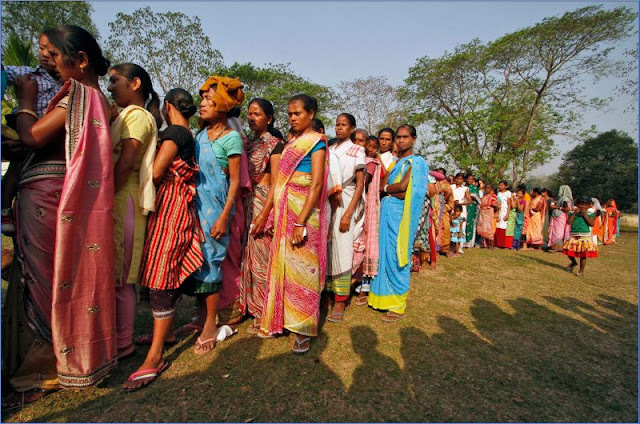 On Monday, the Assam Chief Electoral Officer (CEO) Mukesh Sahu said that in Assam, around 1.2 lakh persons were tagged as ‘D’ Voters this Parliamentary election. The ‘D’ voter is a category of voters in Assam who were disenfranchised by Foreigners Tribunals under the jurisdiction of the government for lacking proper citizenship credentials. Though most of the people tagged as ‘D’ voters belong to the Bengali-speaking Muslims and Bengali Hindus, many Gorkhas and other ethnic groups have also been carrying the tag since long. “The Gorkhas living in Assam are mostly descendants of those who migrated or were transferred from Nepal as soldiers, road construction and tea plantation workers, labourers working for the railways and associated industries like coal and marginal farmers, by the British,” said Dipak Nirola, Secretary of the Assam Gorkha Sanmilan (AGS). “But in Assam, despite living here since history, many Gorkhas are being harassed by the authority by slapping ‘D’ voter tags. People are very unhappy,” he added. Nirola alleged the harassment of Gorkhas at the hands of the state government because a previous notification by the Ministry of Home Affairs had stated that Gorkhas are not ‘foreigners’ under the provisions of the Citizenship Act 1955 - if they are born in the country; acquire citizenship by registration or naturalisation or were Indian at the time of Constitution was exercised. The notification though directed Assam government not to refer such cases related to the Gorkhas to the Foreigners’ Tribunals, which shifts the onus on the accused person to prove that he or she is an Indian citizen, many from the community allegedly continue to face the ordeal. For 52-year-old Durga Devi Thapa, a resident of Udalguri district’s Chandana village, some 90 km from the state capital, the ‘D’ voter tag seemed to be haunting her constantly. She was tagged as a ‘D’ voter during the National Register of Citizens (NRC) process for the second time despite proving her Indian citizenship before a Foreigners’ Tribunal in 2014. “Both me and my husband, who worked in the defence sector, were marked as ‘D’ voter in 1997. After much trouble and delay, we had the ‘D’ tag removed in 2014. Then my name also appeared in voter list during the state polls. But while the NRC was updated, I was once again marked as ‘D’ voter. Is it a stupid game or the state authorities are so inefficient?” she asked. Due to the ‘D’ voter tag, these people have also failed to get their names included in the NRC, which is being updated under the direct supervision of the Supreme Court. In 1997, during an intensive revision of electoral rolls, the Election Commission had ordered that the letter ‘D’ be written against names of those voters who allegedly failed to prove their citizenship. Their cases were referred to the Foreigners’ Tribunals in the state. A person declared as ‘D’ voter is not given the elector’s photo identity card and is barred from casting vote. “An estimated 23,000 to 25,000 Gorkhas are still carrying the ‘D’ voter tag. When BJP came to power in the state in 2016, it promised that the issue will be resolved. But it seems like the BJP government is not serious about solving the problem. Otherwise, the government would have followed the MHA notification,” the Sanmilan leader said. The draft photo electoral roll prepared by state election department in September 2018 stated that there were at least 1, 19,559 ‘D’ voters in Assam. The database was prepared with the input of the district election officers. This number was 1, 60,051 in the 2005 electoral rolls. When the marking started first in 1997, there were reportedly 2, 20,092 ‘D’ voters in the state. Out of the seven parliamentary seats where there is a sizeable Gorkha population, Tezpur has the highest number of around three lakh Gorkhas. In the remaining, the number of Gorkha voters range from 60,000 to two lakh. However, following the resignation of Tezpur’s incumbent MP from BJP, Ram Prashad Sharma, the All Assam Gorkha Students’ Union (AAGSU) threatened to vote against BJP. “We have a lone representative in the parliament from the community and if he is deprived too, then the community people have to rethink their stand,” said AAGSU President Prem Tamang. The student body reminded that Gorkhas in Assam had voted against the Congress for denial of ticket to then Tezpur MP, Moni Kumar Subba who is also a Gorkha. In a previous complaint to the MHA, the student group alleged that approximately 1.5 lakh applicants from their community have been excluded from the NRC final draft, of which over 20,000 are ‘D’ voters. The process of marking of ‘D’ voters has been criticised for irregularities. Anyone with a ‘D’ classification is immediately left out. In Assam, over 20,000 ‘D’ voters or ‘Doubtful voters’ from Gorkha community may strike a ‘dent’ in the ruling BJP’s vote bank over the state’s three-phased Lok Sabha polls.